Perhaps one of the most important benefits that video conference offers to federal and state employees is the ability to improve work life balance. Healthy work life balance has been shown in multiple studies to improve morale, performance, and job loyalty—making it a great investment from both the organizational perspective and the employees’. Mobility and flexibility—especially as a greater variety of mobile video conferencing solutions become available—are a big plus, too. No longer might a meeting have to be delayed due to the time and travel restrictions imposed on in-person conferencing. No longer might a key player be excluded from contributing their knowledge due to geographical distance or a conflicting schedule. There’s no doubt that secure video conferencing software solutions can contribute to enhanced collaboration between government employees, contractors, and other resources. Enterprise video conferencing options include so much more than face to face communication. They allow file sharing, interactive presentations, and much, much more. Interactive video conferencing doesn’t just offer benefits in terms of inter-office communications, or mobile communications between government employees. It’s also an important tool for citizen involvement. Town hall meetings and other public events often suffer to low attendance which results in subpar citizen engagement. Video conferencing can make it possible for citizens to participate in dialogue with their representatives and make their voices known, any time and anywhere. Video communications are also making inroads in improving public safety concerns. Response teams can better assess critical situation with the more comprehensive information offered by video conferencing tools. Communication during emergency situations is paramount, and removing obstacles to communications during crises can save lives and resources. One of the biggest challenges facing the justice system is effective communication between counsel and defendants. 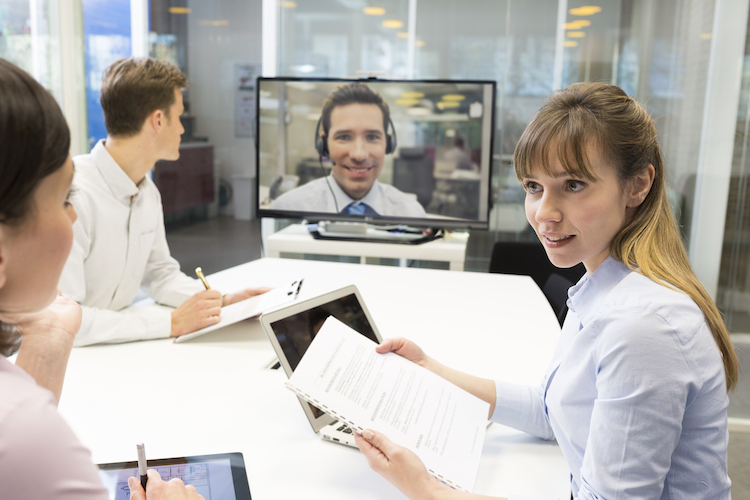 Barriers like distance, cost, and availability can be overcome with the use of video conferencing. This can spell greater savings for taxpayers, better representation for citizens, and an overall better application of our system of justice—it’s a win all around. We’ve referenced spending a few times, but it would be beyond the scope of this article to list every single way in which video conferencing can save the government and the taxpayers money. Reduction of travel costs, streamlined office space, greater communication efficiency in general—video conferencing may require an initial investment in equipment and software, but in the long term it is a huge cost-cutter. Commuting, traveling, and schedule difficulties cost more than direct capital. They also create costs in other ways, perhaps most especially in terms of man-hours, one of the government’s most important resources. A bailiff transferring a prisoner to a meeting, or a lawyer charging for their time to travel there are certainly entitled to compensation—but what if there was no need to spend that time travelling, and only clock in when the meeting starts? Reduction in travel times saves money, but it does much more. What about the loss in productivity from your best negotiator, while they’re flying across country, for example? Government agencies and contractors have specific needs when it comes to video conferencing solutions. There are security and regulatory concerns that need to be addressed, and the specific operational needs of each office or organization. Every industry has its own specific requirements; in government, these requirements can be even more stringent than those that other industries might face. Finding the right solutions doesn’t have to be difficult. The TopAdvisor guide to video conferencing is a fantastic place to begin. Non-biased comparisons of features, cost structures, and platforms can help you narrow down your choices, or refine your short list even further. You can find the link to our guide here. You can even find links to demos, and of course, links to the vendors websites themselves for more information.